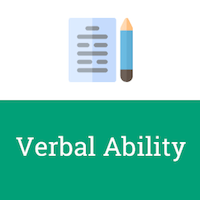 Verbal ability is an important section of most of the competitive exams. It contains different types of questions which are intended to judge abilities in word power, sentence correction, spotting-errors-2 and verbal reasoning. So, to score good marks in verbal ability, the candidates need to have a good vocabulary and a strong command of English like in-depth knowledge of grammar, adjectives, tenses, articles and more. Let us see, understand and practice the most important verbal ability topics or chapters with most frequently asked verbal ability solved questions. 'Ran' should be replaced with 'run', as 'to' is followed by the first form of a verb, e.g., it is difficult for anyone to run on a slippery surface. Copious means abundance or plentiful, so its antonym is scarce. Brief means short, concise, etc. A month after colleges opened for the next academic year 35% seats reserved under OBC remain vacant in private colleges. 1) He was very tired as he is working since 6 O' clock in the morning. He was very tired as he has been working since 6 O' clock in the morning. S: that flows through the city. Furthermore, the city is also known for many famous yoga ashrams. Rishikesh is a beautiful hill station located beside the Himalayas in the North of India. There are many ancient temples along the banks of the sacred river Ganges that flows through the city. Furthermore, the city is also known for many famous yoga ashrams. 1. Maria reached office at 10 O' clock after sending the money. 2. Maria's parents needed some money. 3. After that, she spent almost half an hour at the Post Office. 4. So, she went to bank to withdraw some money. 5. However, she had no money with her. Which of the following should come third in the paragraph? Maria's parents needed some money. However, she had not money with her. So, she went to bank to withdraw some money. After that, she spent almost half an hour at the Post Office. Maria reached office at 10 O' clock after sending the money. Harry who is a professional had a fearful dream. He found himself in a land where he saw some slug-like animals with tentacles living on human bodies. The people tolerated these creatures because after many years they would grow into bulls which then be used for transportation. Harry noticed that he himself was covered with these creatures and he woke up screaming. Question 2: what did the creatures look like? 1) A person who travels on foot. Explanation: Pedestrian is a person who travels on foot, i.e., one who prefers to walk over traveling by a vehicle. Explanation: Tom cannot be trusted as he always cries wolf. 1) Her selection in the crew surprised Peter. Her selection in the crew was a big surprise. Peter was surprised at her selection in the crew. Her selection was a surprise. Peter was surprised at her selection of the crew. 1) They said, "We have lived in this city for many years." They said they have lived in this city for many years. They said that they had lived in this city for many years. They said they lived in this city for many years. They said they have been living in this city for many years. Explanation: Liter is the unit for measuring liquid. Similarly, Kilogram is the unit for measuring weight. 1) ....... Indus River is the longest river in India. Explanation: Article 'the' is used before the names of rivers, mountains, etc.